J-Hooks with Angle Clip These J-Hooks have an angle clip that allows the installer to mount directly to a ceiling, the bottom of a beam, suspended from threaded rod, or to the underneath side of a beam or flange clamp. These J-Hooks have a yellow zinc chromate finish. They comply with UL, cUL, NEC, and EIA/TIA requirements for structured cabling systems. J-Hooks with Bat Wings These J-Hooks are pre-attached to our Multi-Function Clip, enabling the installer to quickly fasten these communication hangers to the tie wire above ceilings, threaded rod, or the side of beams. They are made of a Yellow Zinc Chromate finish and comply with UL, cUL, NEC, and EIA/TIA requirements for structured cabling systems. 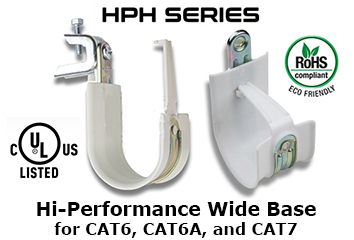 J-Hooks with Insulated Wire Retainer These J-Hooks are the Premium Cable Installation Solution for routing sensitive data communication cables. These J-Hook Communication Cable Hangers Management are made of yellow zinc chromate finish with plenum safe polypropylene insulation. Smooth, safe, unique, aesthically pleasing, and competitively priced. Drive Pins Attachments: Fast Rod Eye Couplings are designed to support 1/4-20 threaded rod for supporting a wide variety of hangers, loops, and rings. Fastens with most any powder actuated drive pin. This is an excellent Cable support system for multi-funtction clips and J-Hooks.